For any visitor to Thailand, the one thing they will see plenty of is Buddha. Buddha statues are everywhere and range in size from tiny-sit-in-your-palm to absolutely Gigantic. 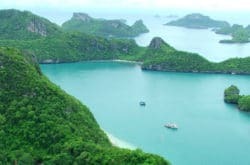 Phuket is one of the top tourist destinations in Thailand, if not THE tourist destination and the landscape of Southern Phuket is dominated by one thing. Sat on top of a hill sits the Phuket Big Buddha and whether you practice Buddhism or not the site is pretty amazing and awesome. Standing 45 meters high the Big Buddha or to be official the Phra Puttamingmongkol Akenakkiri Buddha has the place with the very best views in the whole of Phuket. The Big Buddha was paid for through donations and to keep it maintained donations continue to flow in from locals and tourists alike. The Big Buddha serves two purposes in Phuket. The original purpose and still the primary purpose is a place of worship for Buddhists. From time to time religious ceremonies are held at what is fundamentally a gigantic shrine. 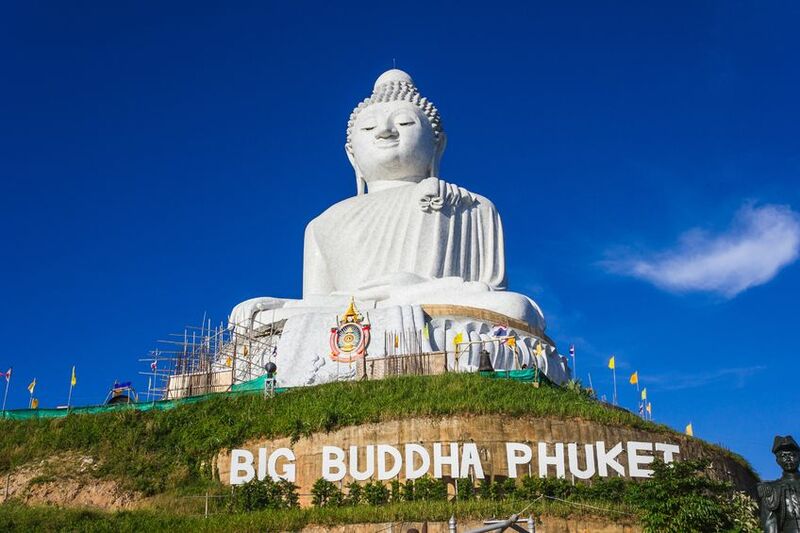 However, a secondary purpose for the Big Buddha of Phuket soon arose once construction was completed in 2004. For some time a smaller Buddha has sat next to where the Big Buddha now is, this 12 meter Brass Buddha was a popular tourist attraction and the new Big Buddha capitalised this fact further. The Big Buddha soon became one of the top tourist attractions in the world. Both Buddhas are well respected religious sites but Tourism it seems is vastly more popular than religion and Thailand understand tourism better than most countries. Upwards of 1,000 people a day frequent the Big Buddha and the statue has become a must see in Thailand. Buddhism is all about finding inner peace and for tourists many are visiting Thailand for some peace. The Big Buddha is situated in almost idyllic surroundings and peace can be felt as soon as one begins the gentle climb to the foot of the Buddha. Once at the statue the view toward the ocean is well worth the effort and the tranquillity is what remains in the memories of every visitor. The story of the Big Buddha is a story worth telling and as part of the statue, tourists are encouraged to visit the museum that tells the story. Being constructed on virgin forest at a time when eco-friendliness was just beginning to become a consideration in major construction the museum clearly explains that the Buddha is not just big but a feat of perseverance that has paid off. For every tourist to the Big Buddha and even the local monks and Buddhists visiting because of their faith, the view from the top is what makes the Big Buddha so magnificent. One only truly gets to appreciate the size of the Big Buddha when up close, it’s base is 25 meters wide and its height seems higher than the 45 meters it actually is. Bit the view as you turn with your back towards the Statue and facing out over the three bays below is what makes you think that this statue does have the best view of anywhere on earth. How to get to the Big Buddha. One of the best ways to get to the Big Buddha is to hike, ideally with a good guide, as you will see the view come alive as you climb. Road access is fairly good and the Big Buddha is well signposted from Wat Chalong. One really cannot miss the statue that dominates the skyline during the day. 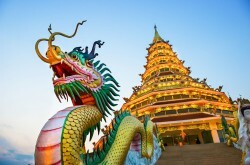 There are also plenty of organised day trips from many hotels, resorts and travel agents to the Big Buddha.